While Detroit’s urban farming movement has been generating excitement for more than a decade, the city’s bicycling scene has been turning heads lately as well. Over the past few years, new bike lanes have sprung up on Motown’s streets and cyclists have shown up in the thousands for mass rides like Slow Roll and Tour de Troit. At the intersection of these two worlds is Rising Pheasant Farms, a small family operation on the city’s east side. Covering about three quarters of an acre, Rising Pheasant Farms encompasses a crop field, family garden, greenhouse and small fruit grove adjacent to the home of Carolyn Leadley, Jack VanDyke and their children, Rowan and Finn. With the help of two part-time workers, the couple harvests an assortment of vegetables including chard, kale, peppers and tomatoes, as well as microgreens and a smattering of berries and asparaguses. Leadley owns and manages the farm, while VanDyke handles markets, deliveries and accounting. Bikes play an integral role in the operation. While many farmers drive hundreds of miles to and from markets, Leadley says they ride just two or three on average to reach their customers at local marketplaces and restaurants. Rising Pheasant’s origins start with Leadley, who developed a passion for growing after an experience working on a rural farm outside of Ann Arbor in 2004. She came to Detroit three years later, at a time when several local nonprofits were embracing urban agriculture. It was with one of these, the Greening of Detroit, that she found employment and received a first-hand glimpse at urban farming in the city. At this time, she put down roots at the Trumbullplex, a collective house and DIY performance venue connected to Detroit’s gardening and bicycling scenes. Collective members grow food at their two-home complex in the city’s Woodbridge neighborhood and over the years have been involved with outside projects like a school farm at the now defunct Catherine Ferguson Academy. Trumbullplexers also established Back Alley Bikes, a youth Earn-a-Bike program linked to a popular neighborhood bike shop called the Hub of Detroit. At the house, Leadley also got to know her future husband Jack, a big-time bicycle aficionado who lived there and worked at the Hub. Leadley and VanDyke now run their full-scale operation from their house in the city’s Farnsworth neighborhood, using methods firmly grounded in sustainable principles. Rising Pheasant also uses organic seeds and grows its own transplants. Beds are hand-prepped, and pesticides and herbicides are avoided. In addition to bike transport, costs are kept down by recycling materials whenever possible. 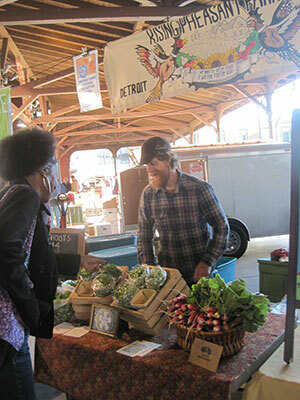 Produce is sold at Detroit’s Eastern Market, and several local eateries. So far this model has been not only environmentally friendly, it’s kept the couple in the black. Last year Rising Pheasant grossed about $53,000 and after expenses like seeds and payroll. The family took in about $32,000 of that. What’s more, they’ve never relied on loans or credit and only taken advantage of a few small grants . While farming itself can be a challenge, working in the city also raises questions for Leadley. That said, she’s impressed by the resilience, courage and creativity of her fellow Detroiters and believes the city’s current struggles hold great value for future generations.